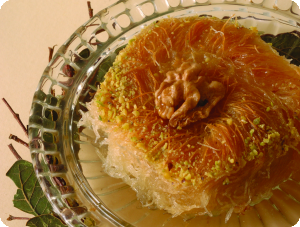 Wrapped Kataifi stuffed with pistachio and soaked with flavored syrup. ½ cup lemon juice Preparation: you need a pan of 35 cm. We rub “katntaifi” flakes with our hands, so as to spread “its hair”. We spread “kantaifi” and divide into small lines (about 25cm. longitude). Right after, we get the pieces one by one by adding peanuts along their length. We then grab the lines and turn each edge in the opposite direction. Then we wrap trying to form it like a snail. We continue with the same procedure for all of the “kantaifi” flakes. We place the pieces in the pan and pour the butter all over the cake, then preheat the oven and bake at 180C for an hour. Syrup Dressing: When “Bourma kantaifi” is out of the oven, we leave it until it is warm and we fill it with the syrup, which should be quite hot. Finally, we wait for about an hour until it is ready to be served. 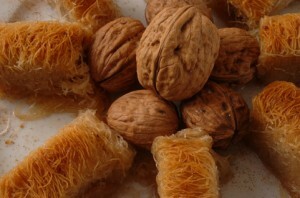 Pressed down Kataifi flakes stuffed with walnuts and light syrup. ½ cup lemon juice Preparation: you need a round pan of 35 cm. We rub the “katntaifi” flakes with our hands, so as to spread “its hair” and use a knife to cut it into small pieces. Then we melt butter, and pour it in caster sugar until it is ointment. We butter the interior of the whole pan very well. We place half the amount of “kantaifi” flakes to the bottom of the pan, spread the nuts, and above the nuts we place the rest of the “kantaifi” flakes. After we have finished, we take one metal sheet smaller than the baking pan, we close the pan and place a heavy object over it so that it is pressed down. We leave it that way for about 1 hour and then we preheat the oven and bake at 180C for about 50 minutes. Syrup preparation: In a pot, we add water, sugar and glucose and boil them over low heat. Once the syrup boils, we add the lemon juice into the pot and stir. Then boil it until it is thick enough. Syrup Dressing: As soon as the sweet is ready, we fill it with warm syrup, but with slow moves. We wait until the sweet is cool enough and then pour the warm syrup in the pan. Finally, we wait for about an hour until is ready to be served. 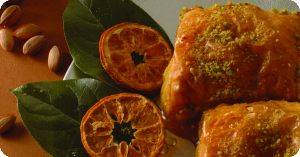 “Kantaifi” stuffed with white cheese, pistachios and light syrup. Baked the exact time is ordered! ½ cup lemon juice Preparation: We will use some small individual pans. We rub the “kanttaifi” flakes with our hands, so as to spread “its hair” and use a knife to cut it into small pieces. We butter all the pans and spread a layer of “kantaifi”. We add the ground cheese above the whole surface of the “kantaifi”, and cover with one more layer of “kantaifi”. We press it with a spoon and then we oil it. We repeat the same procedure with the rest of the pans. Then once it’s ready, we place one pan to another and add a heavy object on the top. We put it aside for about half a day. “kiounefe kantaifi” is always eaten when it’s hot and this is the reason why we bake and fill it with the syrup only when we want to serve. So, we put it in the fridge and when you want to bake it, you do so at 195C for 25 minutes, with caution. Once we get the parts out of the oven, we immediately pour the hot syrup in the pan. We wait for a while and then we serve. Small kataifakia stuffed with walnuts and filled with syrup. We rub the “kanttaifi” flakes with our hands, so as to spread “its hair”. We then soak some “kantaifi” flakes and let them rest for five minutes. Later, we create very small parts with the “kantaifi” flakes, by placing them on the table. Then we fill each piece with walnuts. After this process is completed, we wrap each piece in a roll, placing them in the pan one next to another as tightly as possible. When the pan is filled, we melt the butter and sprinkle it with a brush to every piece. Then we preheat the oven and bake at 180C for about 1 hour. Syrup Dressing: Wait until the sweet is cool and pour warm syrup in the pan. Finally we wait for about an hour until it is ready to be served. Classic Baklava embraced by liquid chocolate. You’ll love it! Spread the crusts two by two into the pan in such a way that they adapt to the size of the pan. Right after we butter them. We repeat this process until we reach the 1/3 of crusts. We pour the first bed of walnuts. We repeat this procedure with the remaining 1/3 of the crusts by spreading the rest of the walnuts. We continue with the remaining crusts, while by buttering them sufficiently. 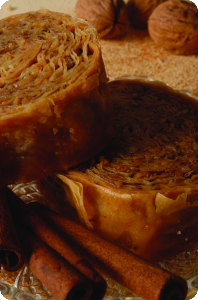 We cut the “baklava” into pieces and dimensions of your taste. Then we preheat the oven and bake at 180C for 60 minutes. Syrup Dressing: When “baklava” is out of the oven, we pour warm syrup. Finally, we wait for about an hour until it is ready to be served. Preparation of chocolate: First of all, we need to have your sweet cool. Then we melt the chocolate with the bain-marie method. We remove the pieces from the pan one by one and dip them in the melted chocolate. Then we place them on a baking paper until chocolate thickens. Once we follow the same way with all the pieces, we put them in the fridge. Thin and crispy crust combined with walnut and pistachio. Combined with light syrup. Spread the crusts two by two into the pan in such a way that they adapt to the size of the pan. Right after we butter them. We repeat this process until we reach the 1/3 of crusts. Spread the first bed of pistachio. We repeat this procedure with the remaining 1/3 of the crusts by spreading the rest of the walnuts. We continue with the remaining crusts, while by buttering them sufficiently. Then we preheat the oven and bake at 180C for 50 minutes. Thin crusts with butter wrapped with walnuts, cinnamon, cloves is the epitome of flavor. We add cinnamon in the mashed walnuts and then mix them. We lay two crusts and the walnuts in their whole surface. We add two more crusts and sprinkle them with walnuts and repeat the same process until we reach 16 beds. By catching the one side of the crusts, we make a roll out of the whole amount of the crusts. We cut the rolls into rings. Their thickness should be at about 2,5-3 cm. We place the rings, one by one, in the pan, the one next to another. As long as we have put all the pieces we melt the butter and pour it to the pieces evenly. Then we preheat the oven and bake at 1800C for 1 hour. Syrup Dressing: When the sweet is baked we dress it with the hot syrup. Right after, we wait for about one hour until is ready to be served. This is the same recipe with that one of “saragli” but in a size of a bite. Juicy rich flavor. ½ cup lemon juice Preparation: In two crusts we spread peanuts. We spread the peanuts to the entire length of the crusts and then wrap them tightly. We repeat this process with another two crusts until we have created a roll of 3-4 cm. Then we cut the rolls one by one into round pieces of 2 cm. Finally, we place them in the baking pan. After we have placed all the pieces in the pan, we melt the butter and pour it all over the pieces. Syrup Dressing: Once the sweet is ready we dress it immediately with hot syrup and put it aside for about an hour. Thin crust wraps a delicate pastry cream and is covered by syrup and pistachios. It challenges your taste. ½ cup lemon juice Cream Preparation: In a pot, we add some milk and half the amount of sugar and we boil them. In a second pot, we add the eggs, the rest of sugar and semolina. When the mixture of the first pot is boiled, we add it to the second pot slowly, and stir it, so as to be assimilated. We put the pot back on the stove so as to be boiled, and stir it .Then we put it aside to and wait to cool at room temperature. Crusts Preparation: you need a pan of 45 x 30 cm diameter. We cut the crusts in size of 10×10. Then we fill them two by two in their center with a spoon of cream. We wrap them very well and drain them at the edges. We place the pieces one by one in a baking pan tightly. Then we melt the butter and pour it all over the pieces. Then we preheat the oven and bake at 180C for 1 hour. Syrup Dressing: When the sweet is out of the oven, we drain the remaining butter in the pan. Right after, we dress the sweet with hot syrup. We waiting for about an hour until it is ready to be served. Serving: “Vizyr Parmak” is garnished with pistachios (grated fine). Thin chocolate pastry crust stuffed with cream and covered by syrup and coconut. Juicy Chocolate delight! ½ cup lemon juice Cream Preparation: In a pot, we add milk and half the amount of sugar and boil the mixture. In a second pot, we add the eggs, the remaining sugar and semolina. When the mixture of the first pot is boiled, we add it to the second pot slowly, and stir it, so as to be assimilated. We put the pot back on the stove so as to be boiled, and stir it .Then we put it aside to and wait to cool at room temperature. Smyrna‘s sweets which look and taste like “melomakarona”. They are fasting and match with coffee and mastic’s drink. They’re ideal for a dinner’s dessert. 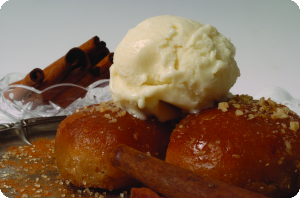 It can be combined with ice cream for an incredible harmony of flavors. We mix flour, sunflower oil, ammonia, sugar and baking powder until they are assimilated. We place the dough in a mixer, and add water slowly until the dough becomes tight. As soon as we have completed the mixing, we put the dough aside on a workbench. We cut into either small or large pieces, and place them in the pan. We preheat the oven and bake them at 200C for 20-25 minutes. Once they are baked we put them aside and wait to cool at room temperature. Frying Preparation: In a frying pan we pour and heat a big amount of oil. Then we begin to fry “foinikia”. As soon as they become brown we remove them from the pan. Syrup Dressing: We drain “foinikia” and right after we pour the syrup, which should be cold, and put them aside for a couple of hours to be soaked. Small sweets made of semolina and vanilla, slightly filled with syrup. ½ cup lemon juice Preparation: In a pot, we add milk, the eggs, baking powder, caster-sugar and heat the mixture until it is even. Later and when the mixture has cooled, we add butter and with slow moves we also add semolina and flour until the dough is thick enough. We place the dough on the workbench and create it, we form small balls and place them in the pan. We place a hazelnut onto each piece. Then we preheat the oven and bake at 180C for 40-45 minutes. Syrup Dressing: Once Seker Pare is ready, we dress it with hot syrup immediately and put it aside to be soaked for several hours. Semolina, eggs, milk, vanilla are embraced within this sweet. Unique Experience! Then we score pieces to the sweet with a knife, and garnish them with one or two almonds. Then we preheat the oven and bake the sweet at 200C for 30-45 minutes (high and low, without air). As soon as the sweet is ready and warm, we spread yogurt over the whole surface with a brush. Finally, we dress the sweet with syrup.Syrup preparation: In a pot, we add water, sugar and glucose and boil them over low heat. Once the syrup boils, we add the lemon juice into the pot and stir. Then boil it until it is thick enough. Thin crust which wraps some special cream made of buffalo milk. It is served with syrup and pistachios. Unique taste from Chatzis! ½ cup of lemon juice Preparation for cream: In a pot, we add milk and half the amount of sugar and boil the mixture. We cut 4 crusts in a cross shape so as to make four pieces. Then we fill them two by two in their center with a large spoon of cream. We go on with the wrapping, which should take the form of a gift package. We place them in the pan and go on with the same process. Finally, we melt the butter and pour it into the pan so as that the sweet is covered totally. Then we preheat the oven and bake the sweet at 180C for 1 hour.